A man and a woman suspected of taking part in a shooting that killed 14 people and wounded 17 at a San Bernardino social services agency on Wednesday died in a shootout with police hours later. The suspects fled the scene of the shooting, and two people died a few hours later in a shootout when police confronted them in their getaway vehicle. One police officer was injured. The shooting rampage at a holiday party on the campus of an agency that serves the developmentally disabled marked the deadliest U.S. gun violence since the massacre at Sandy Hook Elementary School in Newtown, CT, in December 2012, in which 27 people, including the gunman, were killed. But the massacre differed from most other killing sprees in key ways, including the involvement of multiple people rather than a lone perpetrator. It also comes less than three weeks after the deadly attacks in Paris prompted tighter security at many public venues across the United States. Authorities said they also detained an individual seen running away from the vehicle, but investigators were not immediately sure that person was involved in the case, San Bernardino Police Chief Jarrod Burguan said at a news conference. Burguan said the two suspects who were killed were armed with assault rifles and handguns and were dressed in “assault-style” clothing. The police chief said he knew of no possible motive for the attack. David Bowdich, an assistant regional FBI director, said authorities had not yet ruled out whether the shooting was an act of terrorism. 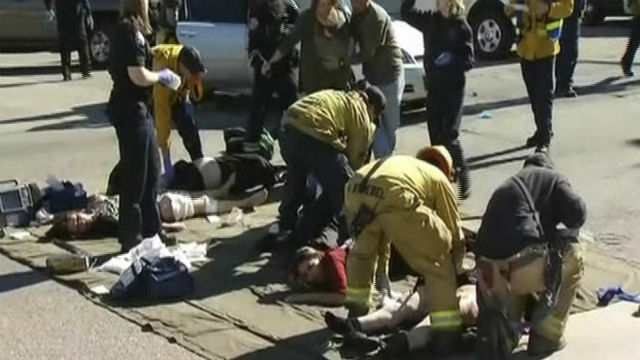 NBC News reported one of the three suspects was identified by multiple sources as Syed Farook. The Muslim advocacy group CAIR said it condemned the shooting and a relative of a suspect named in media reports will take part in an evening news conference. A person by the name of Syed Farook was listed on county documents as an employee of the San Bernardino County Environmental Health Department. Staff members from that department had gathered on Wednesday for the party where the shooters opened fire. 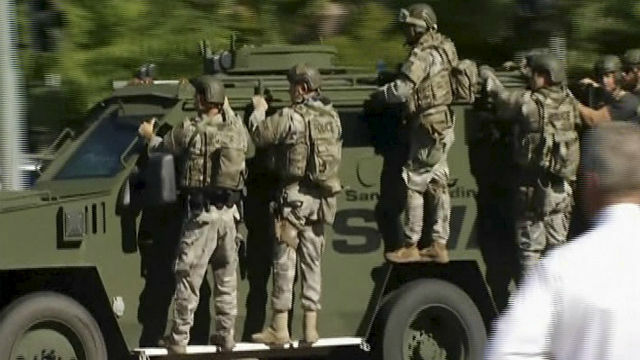 The attack took place on the campus of the Inland Regional Center, in a building housing a conference center that was being used for the holiday celebration, authorities said. The Los Angeles Times, citing information from a senior federal official who was monitoring the case, reported that investigators believe one of the shooters left the party after getting into an argument and returned with one or two armed companions. Burguan said he was aware someone left the party following a dispute but did not know whether that individual returned. The chief said he knew of no possible motive for the shooting spree. 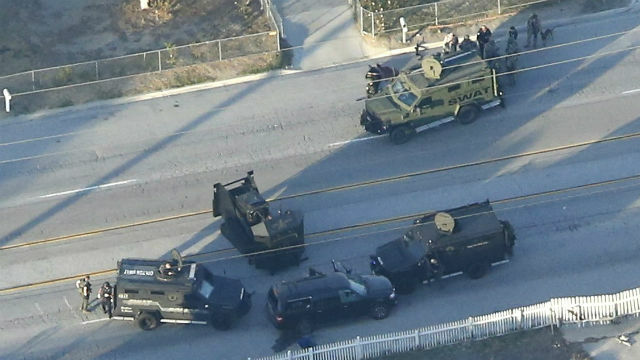 Burguan said the manhunt initially led police to a home in the neighboring town of Redlands, and that police pursued a suspected getaway vehicle that was seen leaving that address back to San Bernardino, where the shootout ensued. The FBI’s Bowdich said federal agents and local law enforcement were being cautious about entering the house in Redlands because of concerns about explosives that might have been left there. So far in 2015, there have been more than 350 shootings in which four or more people were wounded, according to the crowd-sourced website shootingtracker.com, which keeps a running tally of U.S. gun violence. The shooting in California comes less than a week after a gunman killed three people and wounded nine in a shooting rampage at a Planned Parenthood clinic in Colorado Springs, Colorado. In October, a gunman killed nine people at a college in Oregon, and in June, a white gunman killed nine black churchgoers in South Carolina. Gun control advocates, including President Barack Obama, say easy access to firearms is a major factor in the shooting epidemic, while the National Rifle Association and other pro-gun advocates say the Second Amendment of the U.S. Constitution guarantees Americans the right to bear arms.